If I were to put together a picture of my ideal weekend, I think it would look a lot like this weekend past. It would have to involve family, friends, lots of laughs and a touch of adventure - and that's exactly what our weekend was like! In fact, it was so good that I didn't even mind going to work yesterday because my weekend happiness quota was full to the brim! But let me let you in on what we got up to, shall I?! Our weekend actually started a little bit early as Jesse had Friday afternoon off from work. I cleaned the house in the morning and got stuck into my last little bit of work for the week before jumping in the car to pick up our new toy for the week! We headed to the Mitsubishi Dealership in Arncliffe to pick up a brand new Mitsubishi Outlander XLS 2WD (find out more here) to play with for the week! My car loving husband was, of course, happy as a pig in mud. So happy, in fact, he didn't even whine when I asked if we could head to the shops to grab food for our Ignite kiddos (usually Jesse avoids all shopping centres and grocery stores like the plague :P). 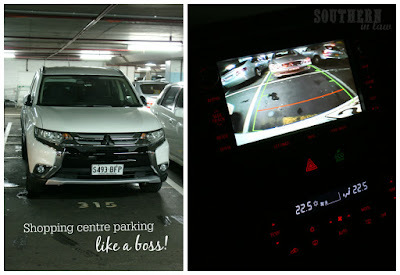 The parking guidelines on the Outlander's reversing camera made shopping in a multistorey car park a breeze - even on a busy Friday afternoon! We quickly picked up the ingredients to make carbonara pasta for our Igniters. After another crazy night of Ignite (those kids have serious energy) I flopped into bed to get some rest, ready for a busy day ahead! 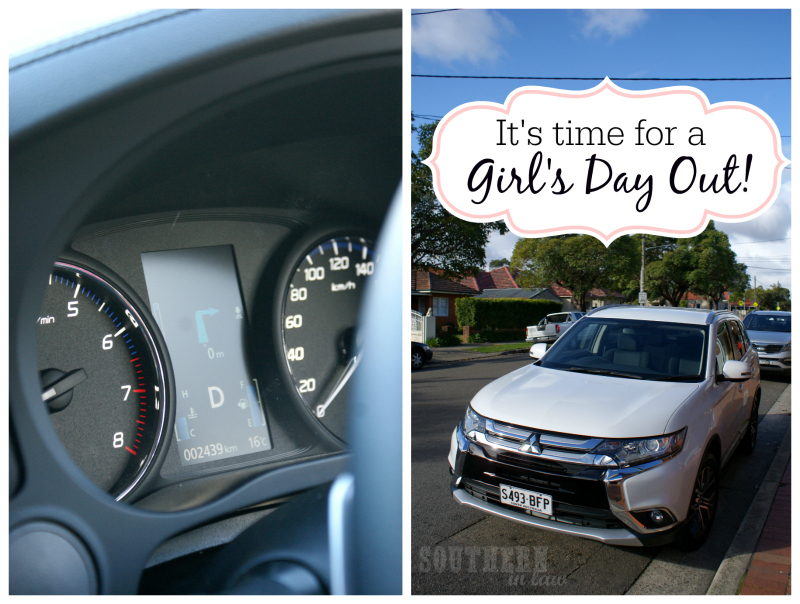 Since we had the Outlander to play with for the week, I thought it was the perfect excuse to round up some girlfriends and organise a Girl's Day Out! Ali and Kristy (yes, we share the exact same name and spelling - and we're both exceptionally awesome ;P) arrived at our house and we all hopped into the car with my Mama to head over and pick up Larissa ready to head to the AMP Macquarie Centre. This was the first time any of us had been there in a long time (if not ever) so we popped the address into the Outlander's inbuilt GPS system and we were good to go! We have a GPS system in our car, however, I was super impressed that the Outlander actually has the directions pop up right in front of you on the multi information display which also shows you what gear you're in, how many kilometres you've done, what your fuel level is etc. But whatever were we heading to the Macquarie Centre for? High Tea of course! 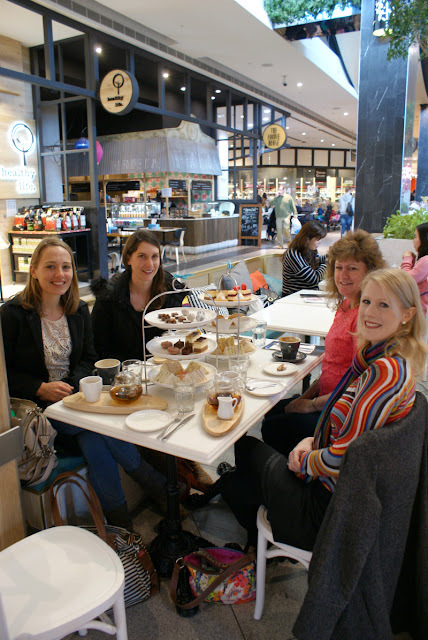 I decided these four ladies needed some spoiling so we headed to the gorgeous Passiontree Velvet for high tea! Passiontree Velvet is located right inside the centre, not too far from Coles and the space is filled with beautiful teal accents, comfy bench seats and the most incredible treats. 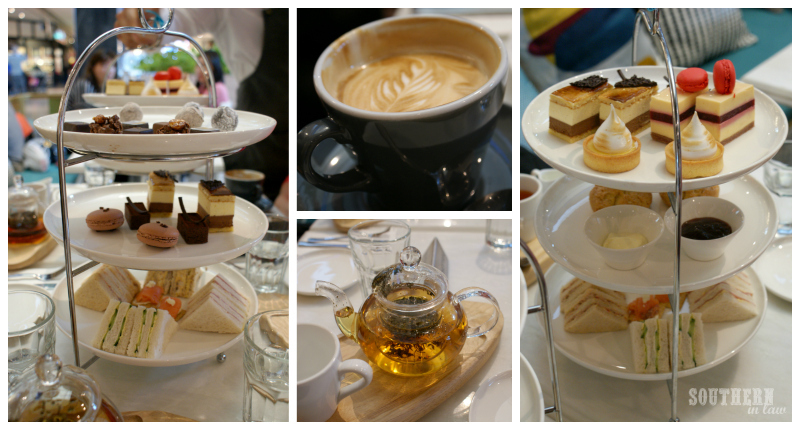 As we booked our High Tea in advance (here's how to book your Sydney High Tea Experience! ), we had a table reserved for us which was just as well as it was buzzing with activity! We took our seats at our table and before we know it our high tea arrived! On the menu for the morning were two different high tea sets and a selection of other goodies. Unfortunately none of these were gluten free but the whole idea was to treat the wonderful ladies in my life so that was a-okay in my books! The Chocolatier High Tea for Two ($32.95 per person) is the one you see on the left (from top to bottom) with a selection of handcrafted chocolates and chocolate truffles (two cinnamon truffles and two butter truffles alongside earl grey, basil and vanilla chocolate bonbons and a chocolate feuilletine crunch), the middle layer had two chocolate macarons, two salted caramel chocolate tarts (with a crisp outer shell and creamy ganache style filling), and two Plaisir Mousse Cakes (dark chocolate and vanilla mousse on top of a vanilla sponge base), finished off with a selection of savoury treats; ribbon finger sandwiches with ham, cucumber, egg and tuna fillings and a smoked salmon and mascarpone canape. The Duchess High Tea for Two ($34.95 per person) is the one you see on the right (from top to bottom) with two Plaisir Mousse Cakes (dark chocolate and vanilla mousse on top of a vanilla sponge base), two Lemon Meringue Tarts (with a crunchy tart shell and smooth lemon curd filling topped with meringue) and two White Chocolate and Raspberry Mousse Cakes (with a layer of raspberry coulis gel sitting pretty between two white chocolate mousse layers, topped with a mini raspberry macaron). The middle layer had two English scones, served with jam and cream and the bottom layer had a selection of savoury treats which were the same as above. Mum and Kristy went for coffee whilst Ali, Larissa and I chose tea. I went for the Peppermint Tea which was amazing (and this girl is a bit of a tea snob) whilst Larissa chose Darjeeling and Ali went for Earl Grey. But the sweet treats didn't end there! We also had a selection of Passiontree's Eclairs and Macarons. 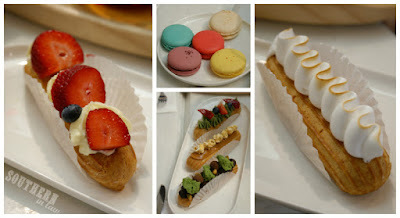 I can't remember exactly what each of the flavours were, however, the eclair you see on the left was the Strawberry Cheesecake Eclair and on the right was the Lemon Meringue Eclair. In the middle photo of the three eclairs I know for a fact that the centre one was a Caramel Popcorn Eclair as I was wishing I could have tried it! The Macarons we had were a variety of flavours; jaffa, blueberry, coconut, passionfruit and salted caramel. But that was just the beginning of the best weekend in a long while! On Sunday we had a much needed sleep in and woke up to a cloudy, rainy morning. We didn't have any set plans for the day ahead, however, one of my favourite things to do on the weekend is jump in the car and drive somewhere and go exploring somewhere different. Despite the weather, we decided to pack up a picnic and jump into the Outlander to head down the coast, through the National Park. We soon discovered the Outlander's automatic windshield wipers as it started raining just a few minutes after we pulled out of our driveway. We amped up the heating in the car deciding that, if worst came to worst, we'd just have a picnic in the car if it was still raining around lunch time. The winding roads of the Royal National Park are always fun to drive though, however, we often find we notice how our other cars lack in the steering department on our way through. The Outlander, however, handles really well - taking each and every corner smoothly regardless of how sharp they may be. Luckily for us, about 10 minutes into our drive through the National Park, the rain cleared up and our picnic plans looked promising! 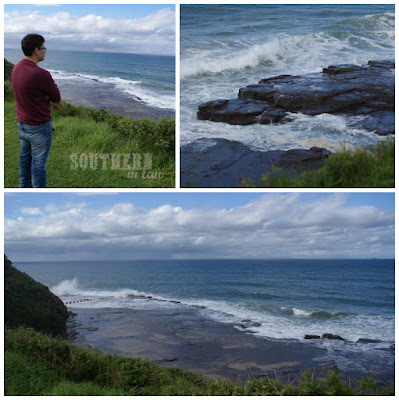 In fact, as we drove along the sky went from a miserable grey to a gorgeous clear blue sky and we decided that our little coastal escape was definitely the right idea. 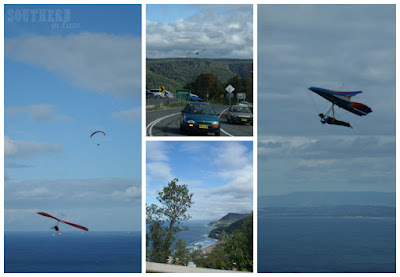 After winding our way through the national park, we decided to pull over around Stanwell Park/Stanwell Tops to watch the hang gliders for a little while from the warmth and comfort of the Outlander. After deciding we'd never have the guts to take up hang gliding as a hobby, we were back on the road to head across the Sea Cliff Bridge! And before we knew it we were there! 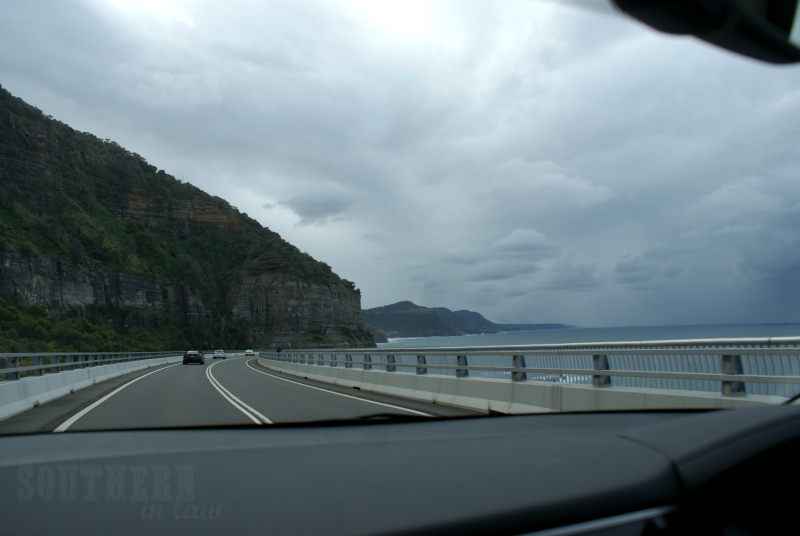 If you live in Sydney and you haven't taken a trip to Wollongong across the Sea Cliff bridge I highly recommend you do (and even walk across it!) as the view is amazing. 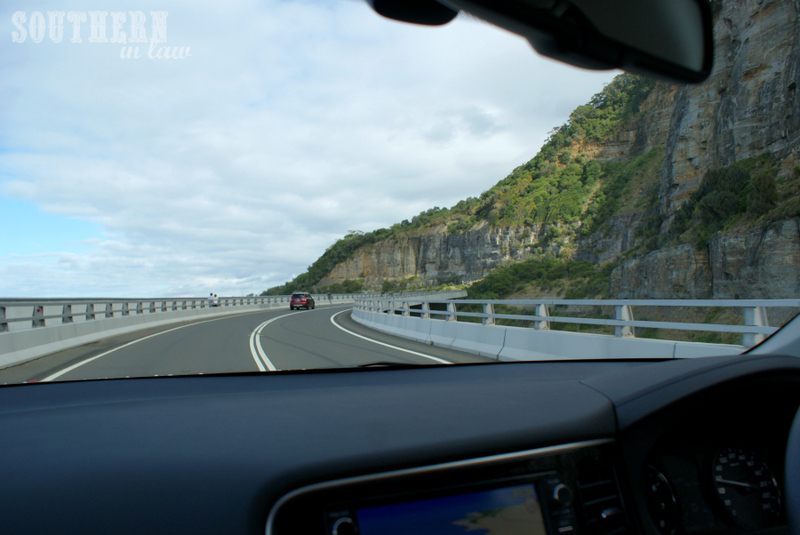 Once we were across the bridge we found a little lookout where we decided to park the car and have a look around. The view of the coast was incredible and whilst it was a little chilly, it was totally worth it. 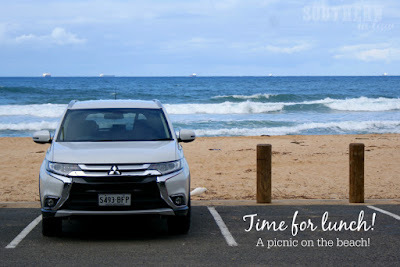 We didn't stay for long though as our stomachs were grumbling and ready for lunch and Jesse had the perfect spot in mind for lunch so it was back in the Outlander to drive a little bit more! I had no idea where we were heading when Jesse flicked on the blinkers and said "I feel like heading to the beach", pulling the car over at Austinmer Beach where he decided we should have our little picnic lunch. 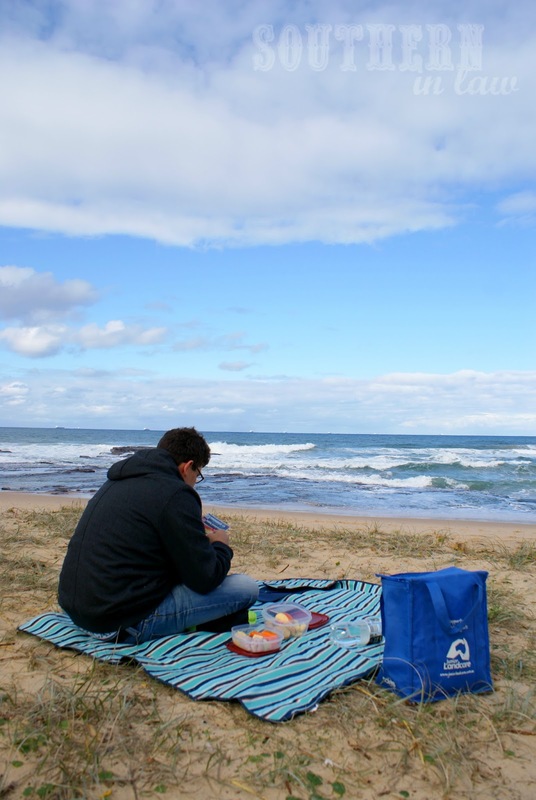 We headed over to a little raised patch of grass by the beach where we spread out our picnic rug and pulled out our lunch. Whilst the air was a little chilly, the sun was out enough to warm us up so it was the perfect spot for a picnic. We'd packed a snacky gluten free picnic lunch with ham, cheese, crackers, veggie sticks, nuts, roasted chickpeas and an apple or two. 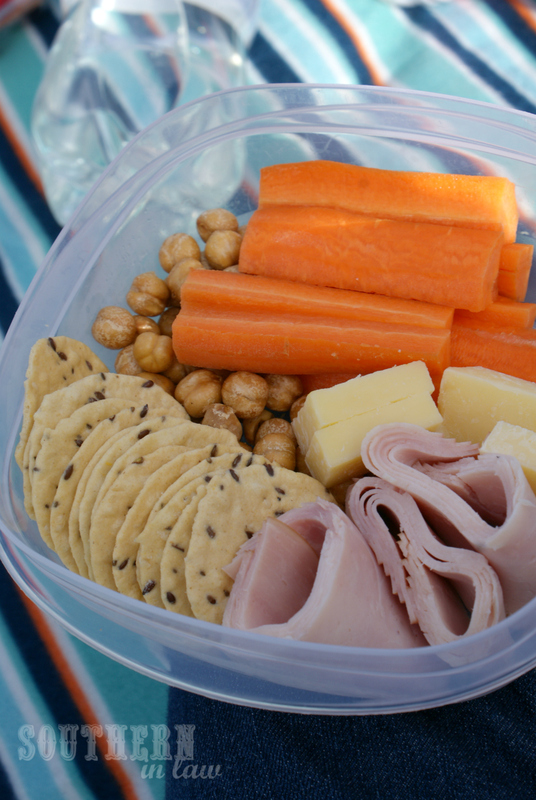 So much nicer than boring old sandwiches! 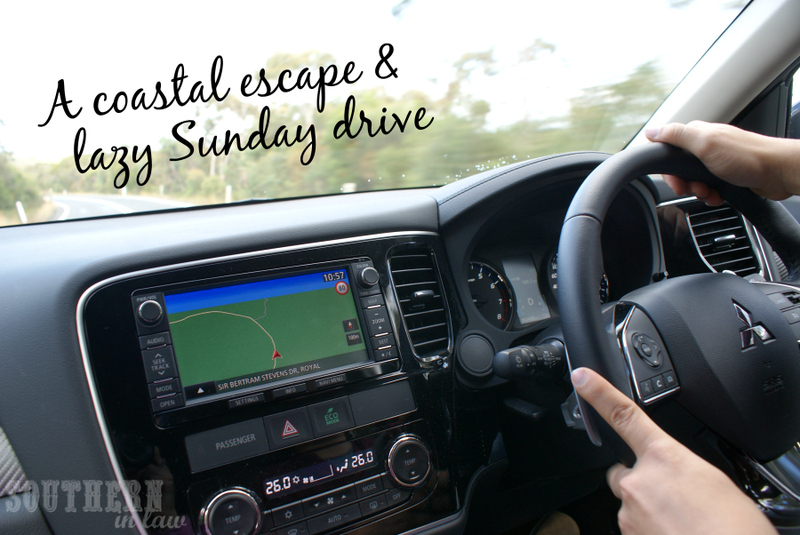 After eating our lunch and soaking up some Vitamin D, we decided to call it a day and head back home in the Outlander. 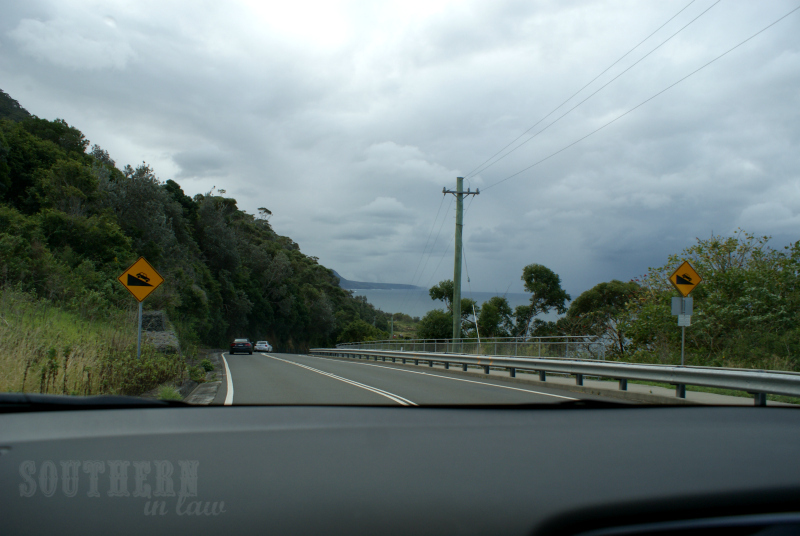 It seemed like we decided to head home just at the right time as the closer we got to Sydney, the darker the sky got. Before long we were home and back where we started, lazing around for a few hours before jumping back in the Outlander yet again for the final part of our awesome weekend! We decided that, since we'd had such an enjoyable weekend, we should top it off with a date night trip to the movies to see Jurrasic World! We both liked the movie, however, we both commented on the fact that we wished there was more of a story line in the first half - however, the second half of the movie totally made up for that! 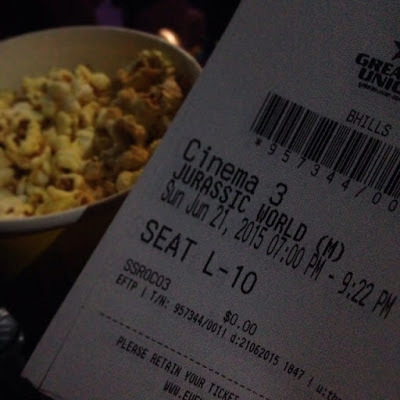 If you haven't seen it yet and you're wondering whether or not you should, I'd say go! 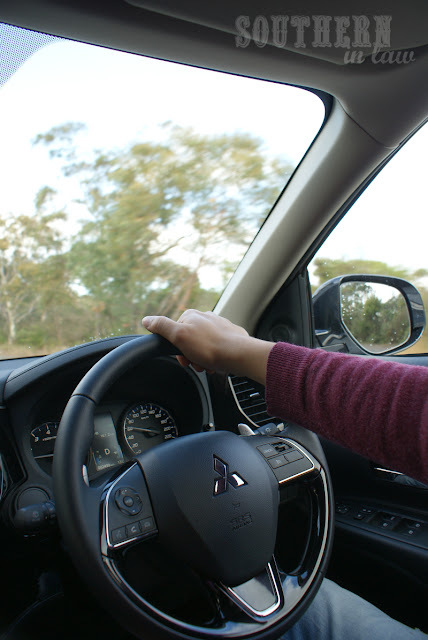 If you're looking to find out more about the Mitsubishi Outlander, head here for more information - and why not book in a test drive at your local dealership? 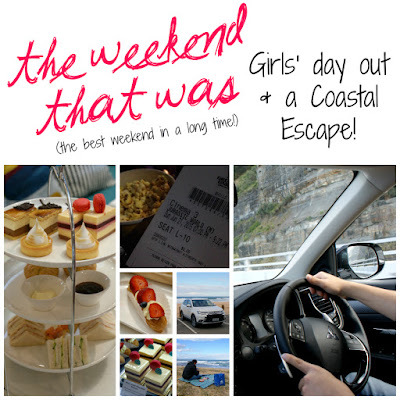 But tell me, what does your ultimate weekend look like? Have you ever been to High Tea or would you ever consider hang gliding? 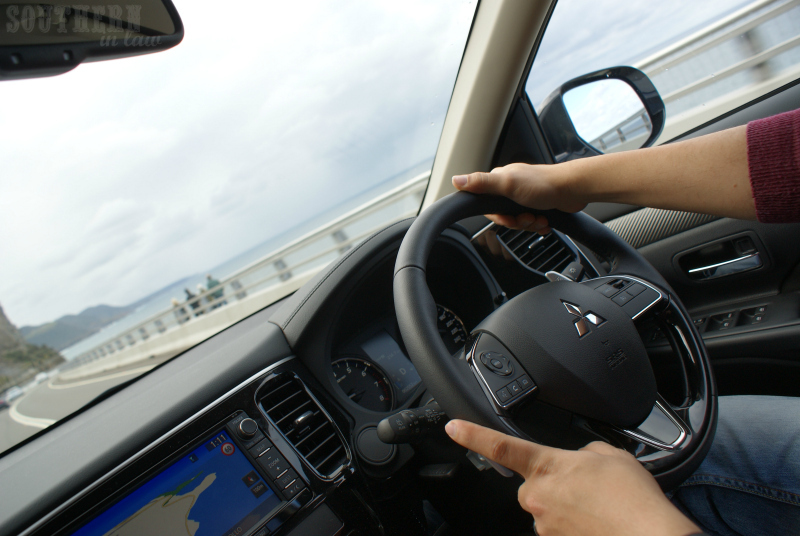 And where would you go if you had the keys to a new Mitsubishi Outlander? This is a sponsored post for Mitsubishi Australia, however, all opinions are entirely our own. Thank YOU, dear reader, for supporting our blog and reading these posts. To find out more about our sponsored posts, click here or contact us. Loved this post! Quick question (because we're buying a new car very soon!) 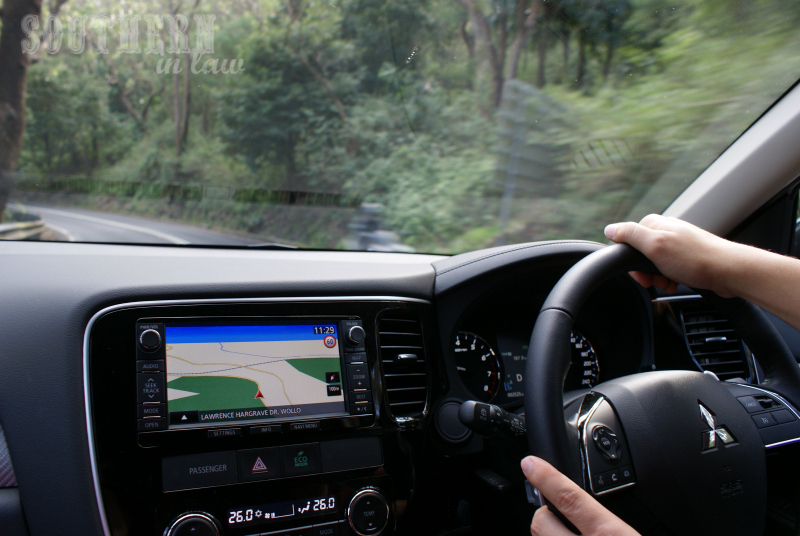 how comfy is the middle seat in the Outlander? Odd question but with two kids who are often bringing friends along it's one to ask! 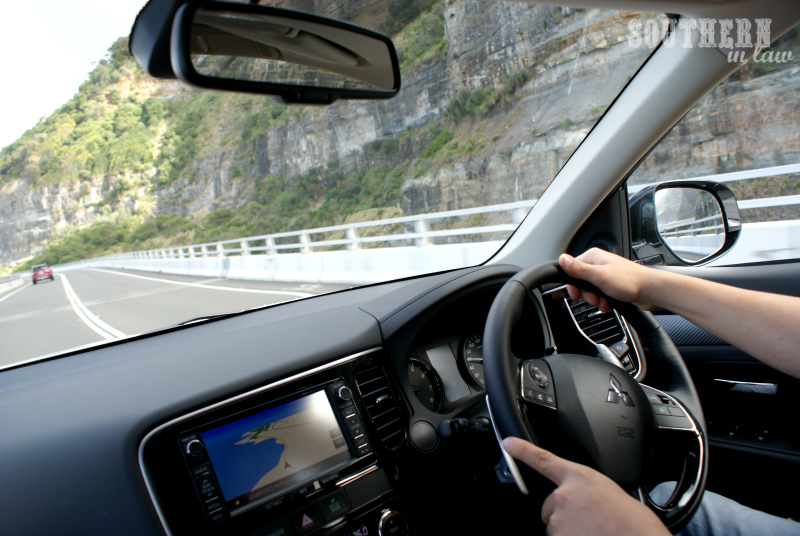 The Outlander also comes in a 7 Seater version which might be better suited to your family? (That way each child can take along a friend - that's exactly the reason my parents bought a 7 seater when my sister and I were younger!) 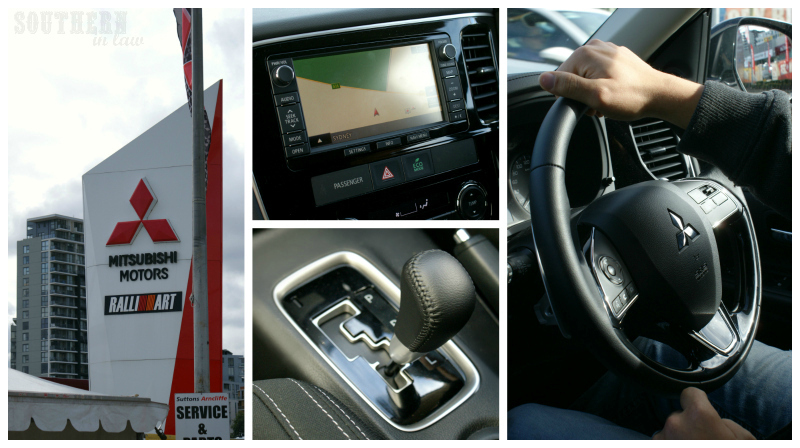 Maybe call up your local Mitsubishi dealer and see if you can book in a test drive or pop by to have a look? We haven't had a look at the seven seater ourselves, however, if it's as good as the 5 seater it's definitely worth a look! So fun! Glad you had such a fun weekend adventure! Is it bad that I've lived in sydney my whole life and have never been to woolongong? 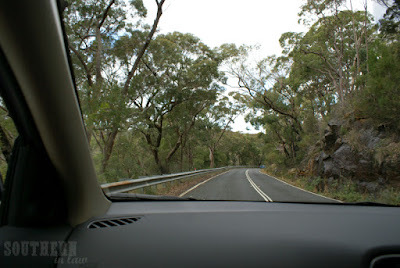 The view looks incredible so I think my bf and I may have to follow what you did and take our own trip in our mitsi!!! It was definitely lots of fun! Hey Claire, High Tea is an English tradition, however, I'm pretty sure it looks a lottttttttt different than what it was in years gone by. Generally speaking, it's an excuse to eat delicious bite sized sweet treats and finger sandwiches (sandwiches sliced into small "fingers" or cut into corners) and sip on yummy teas! Thanks for another great review - my brother drives an Overlander and he couldn't be more satisfied with the car. Kristy, a while back you did a review on the Rocky Horror show - how good is it exactly? I lived in London for a few years and saw West End shows like Cats, the Lion King, Matilda, Les Mis, Wicked and Phantom and I really enjoyed the show. I'm thinking of going to Rocky with friends while we are in Melbourne - can you tell me more exactly how good it is before we purchase the tickets? Hi Sophia, I really liked Rocky Horror and so did Jesse. The whole show was lots of fun - especially if you're a fan of the movie, however, Jesse had never seen the movie before and he loved it too! We've also had quite a few readers email us after booking tickets after seeing our post and they all loved it to!